Over the past 5 years, the boutique hotel craze has taken Israel’s hotel scene by storm, and visitors are loving it. With hospitality on a more intimate scale, boutique hotels offer luxurious facilities and warm settings. Of course, you’ve always got to be on the look out for the frauds (hotels that call themselves boutique, but are really just barebones operations), so here’s a list of Jerusalem’s most highly regarded boutique hotels. At these hotels you are sure to find welcoming hospitality, comfortable accommodations and unique styles, all in central locations. We wish you a wonderful and memorable stay in Jerusalem! Leonardo Boutique Hotel is located in Downtown Jerusalem, just by Safra Square and the lively Jaffa Street. This perfect location allows easy access to the Old City, the colorful Mahane Yehuda Market or any other attraction around the City Center. 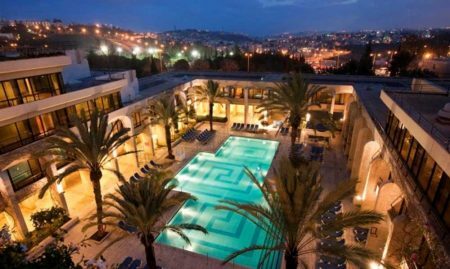 The hotel offers an authentic Jerusalem-style vacation in an exclusive setting for couples or families who wish to indulge and enjoy a wide range of hotel facilities while staying close to the city’s top entertainment centers. The hotel’s interior presents a beautiful mixture of the ancient and the modern. The atmosphere is cozy and relaxing. The guestrooms are designed in an elegant and soft oriental style. Some of the rooms include balconies with views of the Old and the New Jerusalem. You will find a patio lobby, a pampering hot tub and sunbathing beds in the hotel’s garden, and spa treatments. In addition, guests can enjoy a cozy library, a fully-equipped gym, free Wi-Fi, and a fine-dining restaurant with rich breakfast and dinner by Chef Shalom Kadosh. Absolutely perfect! Located in a historic building, Villa Brown Hotel is a romantic boutique hotel that boasts a lavish ambience and luxurious design. The hotel offers 24 guestrooms and suites, a bistro-café, rich breakfasts, international brunches, an English tea party every afternoon, spa, a gorgeous rooftop with breathtaking views, and even a bar located inside a cave! One of Jerusalem’s newest boutique, Shani Hotel offers some of the most spacious and comfortable rooms in the city, warm decor, first-class, modern amenities and a central location at the corner of Hillel on Shamai Streets, just a minute’s walk from Ben Yehuda Street and close to the upscale Mamilla shopping center, the Old City and countless shops and restaurants. Koresh Hotel is a modern hotel located in Downtown Jerusalem offering fully-equipped Deluxe rooms and family suites in convenient prices. The hotel is perfect for families who are looking for spacious suites for their family vacation or for couples who are interested in a romantic getaway in a great location, close to the city’s attractions, restaurants, stores, and vibrant nightlife scene. Tryp Bat Sheva Hotel is located at the heart of the city, offering an exclusive experience that combines hospitality, great location, spectacular views, and culinary. The hotel is situated on the corner of two central streets in Jerusalem: King George Street and Shmuel Hanagid Street, within walking distance from the Old City, the Western Wall, the Great Synagogue, and Machane Yehuda Market. It is a great choice for those of you who are looking to explore the city and enjoy the many attractions Jerusalem has to offer. This hotel is part of one of the largest hotel chains in the world, Wyndham hotel, and it is the only Tryp hotel in Israel. The brand prides itself on its unique and elegant design, boutique ambience, and international standards. Guests will enjoy a restaurant with authentic food, a fitness club, and a small cafe on the hotel’s rooftop. In addition, guests are treated to free Wi-Fi and parking services. Centrally located on Dorot Rishonim Street in Jerusalem’s city center by Ben Yehuda Street, Arthur Hotel was thoughtfully designed to reflect the diverse cultural influences that have left their marks in Jerusalem. The hotel which has 54 rooms is named after Lord Balfour. The classic decor with contemporary hospitality create a hotel that captures the enduring spirit of Jerusalem. Housed in a beautiful historical landmark building in the charming and dynamic German Colony, Villa Ba’Moshava is a romantic boutique hotel in vintage style with just 24 guest rooms. Arcadia is about the small touches; take advantage of the 24-hour reception and the excellent, personal service, use the available bicycles to get around town and sit on the pretty patio for breakfast. Little House Hotels is a boutique hotel chain that offers rural hospitality in three different locations in the southern part of Jerusalem. The hotels are all located within walking distance from the Old City and the city’s major cultural and historic attractions. Bakah, Rechavia, and the German Colony, where the hotels are located, are three of Jerusalem’s most popular areas and you can expect a rich rural breakfast, free Wi-Fi connection, and plenty of amenities in each of the hotels. The hotels are intimate, cozy, beautifully styled, and offer gorgeous views. Looking to add history and authenticity to your vacation? The Templer Inn is the perfect place for that. Housed in an ancient 19th-century building in the picturesque German Colony neighborhhod, The Templer Inn offers one of the best boutique experiences one can find in Jerusalem. 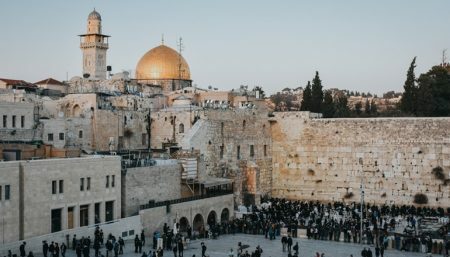 The hotel is exclusive and family-owned, and it is located within walking distance from the city’s best attractions, such as the Old City, the First Station, and the Western Wall. Enjoy trendy and chic lodging with creative, personal touches such as unique art instillations. Facilities include a fitness room, a terrace with beautiful views and a bar. 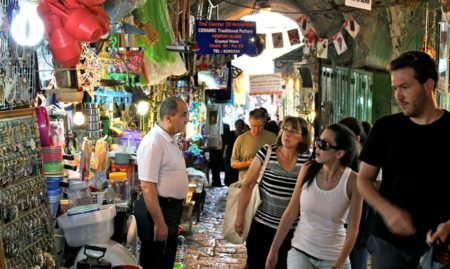 Dan Boutique has 129 rooms and it is located on Hebron Road which is near the First Station, Emek Refaim in the German Colony and the Old City. A picturesque hotel, walking distance from the Old City, the American Colony Hotel won the World Travel Award as Israel’s leading boutique hotel in 2013. American Colony is a five star hotel that has been offering top quality hospitality for over 120 years. The 96 rooms are housed in an Arabesque-style complex that was originally a palace. The recently renovated St. George Hotel rivals the American Colony for some of the most impressive and relaxing facilities in East Jerusalem, with the only rooftop swimming pool in the area, the cozy Al Liwan Lounge Bar and Terrace and the revered Le Petit Levant restaurant, the only fine dining establishment in the city serving purely regional cuisine based on homemade dishes. Nestled on the far outskirts of Jerusalem in the picturesque Ein Kerem neighborhood, Alegra is one of the most romantic hotels in the city, where guests are surrounded by natural beauty, inspired interior design and pampered with luxurious amenities and facilities, including exclusive suites, a wet sauna, a half-acre orchard and rooftop lounge with cozy seating and a first-class, fine dining restaurant. Overlooking the stunning views of the Jerusalem Hills, Cramim Hotel is an indulgent 5-star hotel located in Kibbutz Kiryat Anavim. The hotel’s spacious rooms are designed in a modern and luxurious style. Each room includes a balcony with a view of the beautiful mountains, a television set, adjustable lighting, and free Wi-Fi connection. The hotel’s facilities feature a swimming pool and an exclusive spa, where you can enjoy spa and beauty treatments. In addition, you will find vineyards, monasteries, restaurants, and art galleries, just outside the hotel.